SnapCacklePop: Little Mix to release new album that does not mess about..! Little Mix to release new album that does not mess about..! With their latest single Black Magic dominating the charts across the globe girl group Little Mix are keeping fans happy by announcing another new album entitled, Get Weird. From throwback vibes to ultra-modern production Get Weird encompasses the past, the present and the future of girl band pop and we've got loaded of details. Perrie, Leigh-Anne, Jade Thirwall and recently engaged Jesy Nelson have upped their game with this new album, working with a handpicked selection of pop’s great and good, from Ed Drewett and Maegan Cottone to collaborators who are artists in their own right, like Jess Glynne and Jessie J. 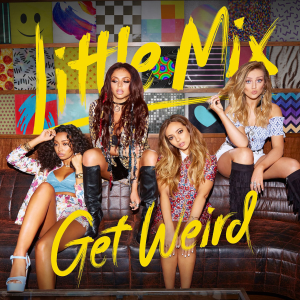 The girls describe Get Weird as “a celebration of being unique and not holding back” which is most evident in track Weird People - a song which finds them embracing their “inner weirdness”. Other stand out tracks include future smash Love Me Like You, Secret Love Song and Lightning which has been described by the band as a sister to 2012’s massive single and SCP favourite DNA. We'll soon see if it lived up the that! Additionally, deluxe track I Won’t represents an important moment of self-discovery for the band as they realise “as long we’ve got each other that’s all we need.” Wowser deep too! "The girls strived to “push everything to its limits”on this new record and make no mistake: GET WEIRD does not mess about"
We will see ladies, we will see. Love your work and grab a copy of Black Magic on iTunes now or pre-order Get Weird now..!